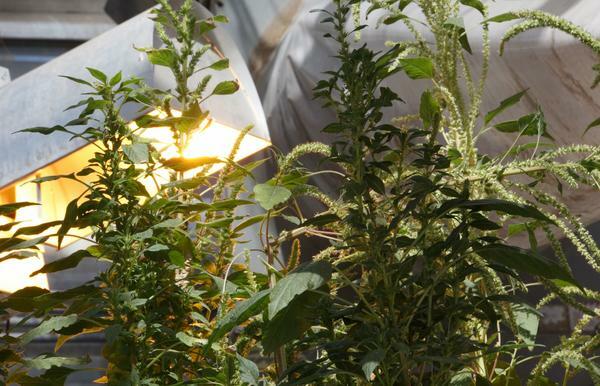 These Palmer amaranth — or pigweed — plants, seen growing in a greenhouse at Kansas State University, appear to be resistant to multiple herbicides. Stanley Culpepper remembers that moment. He'd left his family's farm to study weed science at North Carolina State University. "I was trained by some really, really amazing people," he says, "and I was even trained that there would never be a weed that was resistant to Roundup." These scientists believed that plants couldn't become immune to Roundup because it required too big of a change in a plant's biology. In 2005, though, Culpepper reported that he'd found some weeds that Roundup could not kill. They were growing in a field in Georgia. And this was not just any weed. It was a kind of monster weed called Palmer amaranth, or pigweed. Over the following years, these glyphosate-resistant pigweeds spread like a plague across America's farmland. They're practically everywhere in the South now and increasingly common in the Midwest. "The impact is just unbelievable," Culpepper says. "We've invested over $1.2 billion, just in the cotton industry, for control of glyphosate-resistant Palmer amaranth since we first discovered it." So biotech companies rolled out a new answer: new genetically engineered varieties of soybeans and cotton that can tolerate two other herbicides, called dicamba and 2,4-D. Farmers can plant these crops and then spray those chemicals, often in addition to glyphosate, to kill their weeds. There's a lot riding on these new products, for farmers and for pesticide companies. Dicamba-tolerant crops, in particular, have provoked controversy. But now, even before they've been fully launched, there's evidence that this weed-killing tactic may be starting to fail. The evidence is sitting in a greenhouse at Kansas State University, carefully tended by Chandrima Shyam, a graduate student there. 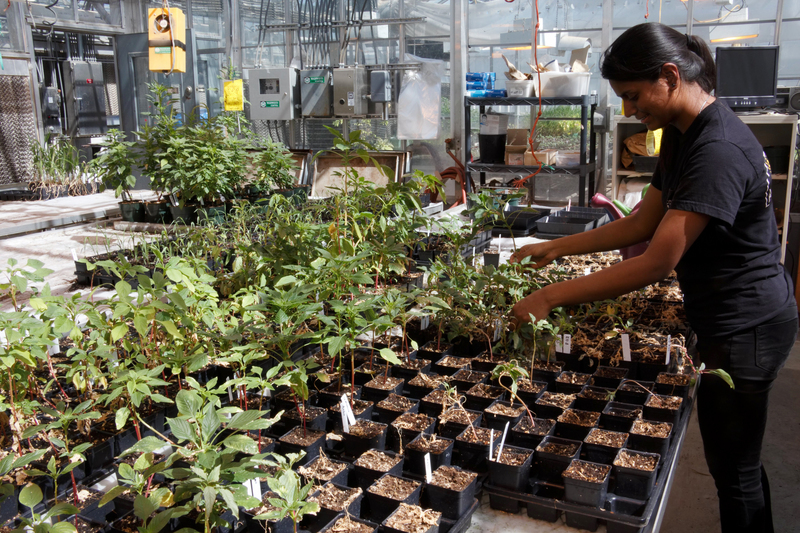 Chandrima Shyam, a graduate student at Kansas State, is hoping to learn how these Palmer amaranth plants survive 2,4-D and other herbicides. "These are plants that were sprayed with 2,4-D. And these are the resistant plants," she says. "You can see that the resistant plants are pretty vigorous." I see trays and trays of green, flourishing pigweeds. They are the offspring of weeds that another Kansas State scientist, Dallas Peterson, noticed last summer in a field where he conducts research. They seemed to survive every chemical he threw at them. "We were just not able to control or kill those weeds following those herbicide applications," he says. He called in a colleague who specializes in research on herbicide resistance, Mithila Jugulam, who in turn enlisted Shyam's help. "So we went to the field. We dug out the whole plants, brought them to the greenhouse and kept them in isolation," Shyam says. They grew 10 Palmer amaranth plants until they produced seeds, then replanted those seeds to produce new generations of plants in order to study them. They found that these pigweeds can survive sprays of 2,4-D. Some plants also appear to be immune to dicamba, although that still needs to be confirmed. The plants probably are resistant to glyphosate as well. Basically, they're a farmer's nightmare. And if they showed up in one field, they're probably in other fields, too. Culpepper, at the University of Georgia, says he's not surprised. Nobody should be surprised anymore by the superpowers of pigweed, he says. "I'm telling you, as a weed scientist, it's just an absolutely fascinating plant," he says. "You have to respect it, and the first thing to respect it is, [know that] this plant will outsmart me if I do the same thing over and over again." Culpepper tells farmers that they still can control this superweed, but they need to use a bunch of different tools. That means deploying multiple chemicals, alternating the crops that they plant, and planting extra "cover crops" in the off season to cover the soil and make it harder for weeds to emerge. Matt Coley, a farmer in Vienna, Ga., says most growers learned a lot from their experience losing Roundup as a cure-all for weeds. "As long as we continue to follow the recommendations not to rely just on one chemistry, I think we'll continue to be able to manage pigweed," he says. But dicamba and 2,4-D are among the herbicides he uses on his cotton crop, and he admits it's a little unsettling to hear about Palmer amaranth plants that these chemicals won't kill. He's hoping for new weapons in his arsenal. "The industry, the manufacturers — for them to be in business, they've got to have farmers," he says. "Hopefully they're utilizing their research and development to continue to provide us with products that will help us control our pests in our crops." The arsenal is running out, though. And that's what worries Culpepper the most. "We haven't had a new way to kill a weed with a herbicide since 1984," he says. Meanwhile, weeds like Palmer amaranth and ryegrass have been defeating one chemical after another. "This is a monumental challenge we're facing. Is dicamba- and 2,4-D-resistant pigweed surprising? No," he says. "[But] the overall issue with resistance is flat-out overwhelming." Scientists have discovered some wild plants growing in a field in Kansas that have a kind of superpower. They can defy the most modern technologies designed to kill them off. It's the latest escalation in a long-running agricultural arms race - farmers versus weeds. NPR's Dan Charles has the story. DAN CHARLES, BYLINE: There was a moment about 20 years ago when some farmers thought they'd defeated weeds forever. Biotech companies had given them a new weapon, genetically engineered crops, that could tolerate doses of the herbicide glyphosate, also known by its trade name Roundup. They could spray this chemical right over their crops, clear away the weeds even though the crops were fine. Stanley Culpepper, a weed scientist at the University of Georgia, says there was talk that maybe weeds would never defeat Roundup. STANLEY CULPEPPER: So I was going to school during this time. And I was trained by some really, really amazing people. And I was even trained that there would never be a weed become resistant to Roundup because it was too complicated. CHARLES: Too complicated because of the way Roundup kills plants. In 2005, though, Stanley Culpepper found some weeds in Georgia that Roundup could not kill. And not just any weed - it was a kind of monster weed called Palmer amaranth, or pigweed. And over the following years, the weeds spread like a plague across America's farmland. They're practically everywhere in the South now, spreading northward through the Midwest. CULPEPPER: The impact is just unbelievable. We've invested over 1.2 billion - with a B - just in the cotton industry for controlling glyphosate-resistant Palmer amaranth since we first discovered it. CHARLES: Biotech companies have rolled out a new answer - new genetically engineered crops that can tolerate two other weed killers, called dicamba and 2,4-D, so farmers can spray those chemicals on their fields to kill the weeds. There's a lot riding on these new products - billions of dollars. But now, even before they've been fully launched, they may be starting to fail. The evidence for this is sitting in a greenhouse at Kansas State University, carefully tended by a graduate student here, Chandrima Shyam. CHANDRIMA SHYAM: These are plants that were sprayed with 2,4-D. And this is the resistant plant. You can see that the resistant plants are pretty vigorous. CHARLES: I see trays and trays of growing pigweed. These plants are the offspring of weeds that another Kansas State scientist, Dallas Peterson, noticed last summer in a field where he does research. They seemed to survive every chemical he threw at them. DALLAS PETERSON: We were just not able to control or kill those weeds following those herbicide applications. SHYAM: So we went to the field. We took - dug out the whole plant and brought them to the greenhouse and kept them in isolation. CHARLES: Shyam and her colleagues collected the seeds, grew new generations of these plants to study them and found these plants can survive sprays of 2,4-D. Some also seem immune to dicamba. They're probably resistant to glyphosate. And if they showed up in one field, they're probably in other fields, too. Basically, they're a farmer's nightmare. Stanley Culpepper at the University of Georgia says he's not surprised; nobody should be surprised anymore by the superpowers of pigweed. CULPEPPER: I'm telling you, as a weed scientist, it's just an absolute fascinating plant. It - you have to respect it. And the first thing to respect is, this plant will outsmart me if I do the same thing over and over again. CHARLES: Culpepper tells farmers they still can control this weed, but they'll need to use a bunch of different tools - multiple chemicals, alternating crops, extra crops in the off-season to cover the soil. This can get expensive, though. Some farmers say they can't afford to do all of it. But Culpepper says they also can't afford to lose this battle with herbicide-resistant weeds. (SOUNDBITE OF LNRDCROY'S "LAND, REPAIR, REFUEL") Transcript provided by NPR, Copyright NPR.